(2) The only excuse not to do something is YOU! I'm exercising even if hyung doesn't tell me to! Ooohhh that's why. Well he does look way younger whenever he cuts his hair short! Awww... I guess we would still be seeing these beastly idols after all of them finished their enlistment. Nichkhun to fans: Don't forget to exercise especially fans standing near the stage. I can see you very clearly!! So who's copying who? Or is this called FATE? I guess thats it for now guys Got to focus on my training now. I hope anyone can still post and update the thread once in a while aside from us big 4 lol @pucca_chan @snixxNKV @Elle1997 To all the silent readers, we would really appreciate it if you would make yourself known Keep the faith guys! Remember we are not alone! We got a whole army of Khuntorians in China that are actively and discreetly following and supporting Khun and Vic! So don't lose hope! Till next time! Khuntoria fighting! Hi all Khuntoria fans! I am a new fan here. This is my first post on this thread. I just want to share my take on this couple. I just finished all of their episodes and my take? Victoria really likes Nichkhun. Between the two it was the girl who held back so much from falling for him real hard because she knows well that it's rare for a public relationship to last.Of course as a new fan of them and as a kpop lover for so long idol relationships really are too tough to handle. Fangirls of the male idol are the scariest. And of course the public's criticism towards the relationship is another factor. That's one reason why I wanted my idols to date privately. I may not be sure of my idols' real relationships but I would be one happy fan to know that they are happy exclusively with the person they love. On the other hand Nichkhun really likes her too, there were times he held back his feelings as well but I can say (as a person who's been in a relationship before) he treated her genuinely. His smiles were real. His smiles were that of a person who was very satisfied with his marriage partner. There were times he hesitated not because he might get rejected by her answer but I can say he held back because he knows that everything will be broadcasted and that in his mind it's a show wherein the feelings shown will be doubted whether or not the feelings are real. So I think if they actually pursued the relationship off cam it would not be that bad. Though it will really be a very tough road to take. PS: Forgive me for being very late on this ship. And btw.. I am aware of the Khunfany years ago as well. IDK how this thread is being managed if there are some people that get offended by my post I'm sorry. It is just my honest opinion. Hope we'll get along well. HELLO!!! And welcome to our beloved Khuntoria thread on Soompi! And yes, of course I agree with your opinion, i do believe that their feelings during and somehow after the show was genuinely. That is why we still holding on and still supporting them because we believe in them even though they never confirmed anything (yet :p). I'm glad that you came here and start supporting them. It's okay if you're late because it's better be late than never, right? It's okay that the reply was later. No worries. He was actually taken aback from the questions. Note he said, "We're". He spoke in Vic's part too. So cute. Speaking like a real man for his significant other. I haven't backread this thread yet but idk if u guys noticed that there's some of a matching thing about them. Nichkhun in a 2PM performance gave a rose to Lee Minjung (actress - I like her too!) And it just so happens that Vic's favorite drama's (Iris) male lead is Lee Byung Hun. Minjung and Byung Hun are married now. Actually I'm a shipper from another thread here but came here so I can share my take on them. Just so cute to find out that Vic is also a Reebok endorser. My other ship is also a Reebok endorser! Btw the very episode that caught my attention big time is Episode 35. When they were rehearsing at SM building. The scenes with Hyukjae were awesome. I felt many butterflies in my stomach watching it. I never actually liked Vic for the previous episodes but when I watched Episode 35 I so learned to see her hidden charms. I liked how she got so shy yet very adorable at the same time looking at Khun's eyes. Kyaaa!!! And that moment when Khun returned the look! That was so epic IN MY EYES! plus their talks about the kiss! how Hyukjae teased them! I thank you Lee Hyukjae for that btw. And Khun's eyes! Expressions! Damn... A very good-looking man. The way he tried to tell her I want a kiss part so badly can u do it with me!?? I just wished watching it that he would've kissed her already if the cameras weren't on them! Kyaaa! My post is taking a long journey already. Gotta stop here. I'll visit here from time to time. I know it's been a couple of days but again Happy happy 8th anniversary to Khuntoria and to us Khuntorians! Time really flies so fast right? I can't believe it's been 8th years since they 1st met for WGM. I still and will always believe in these two no matter what. Regardless of what happens in the future I would never regret in supporting, believing, shipping these two. Keep the faith guys! Khuntoria fighting! Hi there @chantaljaey! I know its been almost a month since you posted but nonetheless welcome to the fandom!! Don't think you're alone because I myself is also a very late Khuntoria fan Regardless if you only became a fan now, we're happy that even after all these years people come to love Khuntoria. It just proved how Khuntoria surpasses the test of time. Don't cha think? That even after many couples have been in WGM people will always mention or remember about Khuntoria. Oh and BTW, where are you exactly in Asia? Just wondering, because most of us here are from Asia. And one thing I love to ask on newbies here is how did you end up being a Khuntorian? We have different stories and I just love to know how fate have brought each one of us to love this very special couple. And BTW if you have any questions feel free to ask, if you have news about them (may it be outdated or not), if you have anything to just share about them, don't hesitate to post here on our thread. First off, I've known this couple long time ago already. I've read many posts and comments shipping them so much. I wasn't curious enough before because I was all crazy with another fandom. Well, Khun is undeniably very good-looking. A very eye-candy for fans. Vic for me before was just fine. She didn't register much to my likings. I know her as Chinese and an f(x) leader but that was it. I am not a fan of f(x) at all. I know Krystal because she resembles YoonA more than her own blood sister Jessica. I know Sulli in To The Beautiful You drama (I did watch the Taiwanese version of it so I got curious how the Koreans will pull it off). But that was it. I remember watching WGM Khuntoria first episode but didn't finish because it didn't catch my attention much. But now? Gawd... the couple is in my mind most of the time all day. The images above wherein Khun put up a thumb up was epic. It awakens my Khuntoria feels~ gawd.. I love these two. I like how these two didn't receive as much hate as my other ship though. How I wish my other ship is like them too. But yeah.. we can't please everyone to love the ones we love. I like how they can freely show signs of affection in public. I mean fans love it even more while antis just there hating. LOL. I am from the Philippines. I hope there are also Filipinos in here. I end up in this ship thru my other ship (TaEun couple). Khuntoria couple has been mentioned many times in another thread (things like how Khun was confused between virtual and reality, their skinships which were very natural (it felt more real). I did watch on YT some clips of them. Gosh. The way they look at each other. Khun's very natural hugs and damn.. all scenes when he carried her! Always daebak! it's so cute and so manly of Khun. Yes. I do have a question, I feel like I missed something. The part around episode 20, before they got their house. In episode 33 (2PM's house visit) Khuntoria showed to 2PM the video they gave Cherleen (Khun's sister). There was part of the video wherein Khun puts his hand on Vic's waist sitting on that big rock (kyaaa!!! I so love that part!) and as far as my memory is concern I wasn't able to watch any episode of that in. Or was it just an absent scene wherein they cut it out? And there was this part too wherein they were in a car (Khun on the driver's seat) and he fed something to Vic. Vic was cautious about her surroundings. Was it the cart zone then they watched Twilight? Was it even a Twilight movie? I hope you can answer me or anyone here. Thank you. KhunToria fighting!!! Hi Guys !! It takes too long for me to be able to post something here.So sorry. And btw, I know it's really really late but HAPPY HAPPY ANNIVERSARY KHUNTORIA AND KHUNTORIANS !! LET'S BE STRONG OKAY ?! Oh hi kababayan ! Hehe Ate @twinkies20 and I are from the Ph too. 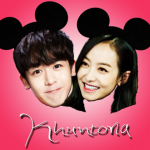 Welcome to our Official khuntoria thread. The Events' team has an Amazing Hunt in progress, so feel free to participate to win some prizes & reputation points! Nichkhun's youngest sister Cherreen appeared with him on a show called Team Chef on 21 July. She appeared in his WGM episodes, right? Short clip of she dancing. Sherleen = Cherreen, right? time really flew. She is a now singer/actress too...like her bro. i hve watched khuntoria for a long time and re watched it lately been a fan them and their interaction is so natural.. i think they truly liked each other but held back due to contracts and their careers..
HEYYYYYY wow, why have I never posted on my OTP's thread? =_=..... Weird enough since I've had this account for 2 years, and probably lurked here before... I'm guessing the khuntoria community has moved to instagram for most of the non-Chinese shippers? I'm saying this cuz I'm Chinese and from the weibo community (as @twinkies20 mentioned above, yes, we are still quite active.) I don't know what else to say, since this thread seems awfully quiet, but if y'all ever feel like it, come to weibo and check it out! OMG!! @Alpaca Tuotuo is that really you? I've been following you on twitter since I created my account there!! I know its very late (and this will probably be the 1st and last time you will post here) but I just wanted to say welcome on our thread! I truly want to thank you for everything! I mean I don't personally know you but I know that you are a true Khuntorian who supports them all the way up until now. Yup, I agree with you. A lot of people have moved to IG because its more accessible and I don't blame them, though I miss the busyness here on our thread before. I can't understand Chinese thats' why I can't really understand all the things posted on Baidu thread of Khuntoria (yeah, this is the only chinese khuntoria site I know since I can't access weibo ). I would just like to ask if how are khuntorians (or winnies) there in weibo? I mean I haven't got news from other KV fandoms in china aside from KV Chuxin union because of their posts on twitter.